Now you can create 3-D, embossed nail designs even faster and easier. 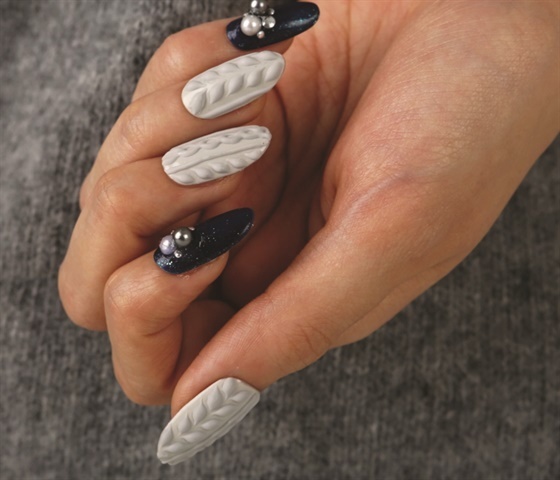 Now you can create 3-D, embossed nail designs even faster and easier with N.O.Q. Gelly Queen 3-D Gel. The 3-D gel comes in a tube dispenser and includes a precise applicator. The self-leveling gel is easy to use and is available in more than 20 colors. 1. Prep the nail for gel-polish application. Apply the base coat, a gel-polish color of choice, and seal the color with top coat. Make sure to cure between coats according to the manufacturer’s instructions. 2. Remove the inhibition layer. 3. Apply the N.O.Q. 3-D Gel #15 in teardrop shapes to create the sweater nail art effect on top of the gel-polish. Flash cure for 10 seconds in an LED lamp. 4. Use a detail brush to help shape the drops of 3-D Gel into a knit pattern by making the edges pointy. Cure for 30 seconds in an LED lamp. 5. Use the precise applicator to apply two vertical lines down the side of the nails to add to the pattern. Cure for one minute in an LED lamp. 6. Wipe the cured surface with a lint-free wipe and cleanser. The nail will have a matte finish. If you prefer a glossy shine, seal the entire nail with top coat and cure. To see this step-by-step in action, please click here.